Golf Mornington Peninsula has launched the inaugural Golf Trail for the Mornington Peninsula with the support from their Premier Partner – Yamaha Golf Cars. The Mornington Peninsula (only 75 minutes from Melbourne) is quickly gaining national and global recognition as a golf destination the equal of anywhere in the world. Golf enthusiasts are discovering that the combination of courses, their accessibility, their variety and the sheer number of them (18 courses and 15 golf clubs) provides a package that is hard to resist. World-famous architects have delighted in the opportunity to work with Mother Nature to create wonderful examples of links, resort and traditional courses. Among these are Moonah Links (designed by Thomson Perrett), St Andrews Beach (designed by Tom Doak), RACV Cape Schanck (designed by Robert Trent Jones Jr), to name just a few. Nine of the Mornington Peninsula courses have been named by Golf Australia magazine as being in the Top 100 Australian courses for 2014. Fourteen of the Peninsula clubs are participating in the Golf Trail and players need only play seven different courses within 18 months to receive a reward of a golf polo shirt and cap. Then play the remaining seven courses within 36 months to be rewarded with a framed photograph of the fourteen courses. The courses provide exhilarating views over Bass Strait and Port Phillip and Westernport Bays. They also have turf quality that rivals that of the famed Melbourne sandbelt. There is nowhere else in the world where you have the opportunity of playing 18 courses of this quality that are all within one hour’s drive. The Mornington Peninsula also offers world-class wineries, fine dining and accommodation, national parks and beaches. 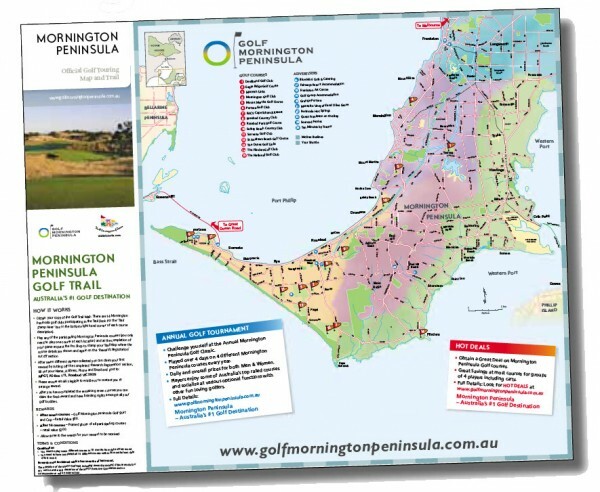 To swing along the Mornington Peninsula Golf Trail, download the Golf Trail now from http://www.golfmorningtonpeninsula.com.au, pick it up from any of the MP Golf Courses or tourism outlets on the Mornington Peninsula or email info@golfmorningtonpeninsula.com.au for more information.